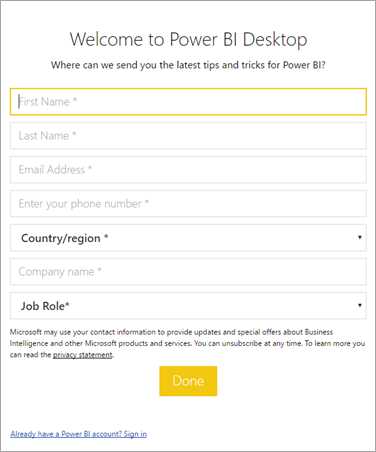 The first time Power BI Desktop is launched, a sign-in form is displayed. Information can be filled in, or sign in to Power BI to continue. Administrators manage this form by using a registry key. Administrators use the following registry key to disable the sign-in form. This can also be pushed to an entire organization by using global policies. A value of 0 will disable the dialog.